I planned to do a post that is actually not about food today, but then the snow came pouring down, and it’s so cold and dreary out, that I just couldn’t help myself. It’s time for comfort food. When Pittsburgh jumped on the burger craze bandwagon a couple years back, the local burger mainstays of Tessaro’s and Fat Heads were joined by the likes of BRGR, Burgatory and Wingharts Burger and Whiskey Bar. I’ve diligently made my rounds to all of them, and must say that Burgatory is my favorite. The downside of Burgatory is that it seems to be everyone’s favorite. The last time I wanted to go there for dinner on a Saturday night, I looked up their online reservation page and the wait was five hours. Suspecting that this absolutely must be some kind of website glitch (why would a restaurant even keep a five hour waiting list?) I called. It wasn’t a glitch. The wait really was five hours. Needless to say, we didn’t get dinner there that night, and we don’t have the opportunity to go very often. On the way home from the airport on Monday evening, I needed Burgatory. Like to my very core. There would be no making it home if there was no stop at Burgatory first. Lucky for us, at 7 pm on this Monday evening, there was no wait whatsoever. I spend entirely too much time reading and drooling over the specials listed in Burgatory’s twitter feed. I was dying to have the Chai shake that was on special for last weekend, but sad for me, the weekend shake specials really are limited to the weekend. I was brokenhearted, but opted for the Prantl’s Burnt Almond Torte shake instead, spiked nicely with Amaretto. It was sweet and creamy and everything that makes an excellent shake excellent. I’m usually a chocolate shake drinker, but the almond flavor of this shake was delightful. My only complaint about the shake is that I can’t finish it without getting ill. The shake is enormouse milkshake size, and comes with the mixer cup with even more shake in it. It’s perfect for sharing, but Mr. Beez and I don’t have matching shake tastes. It would be perfect if they could offer a 12 oz mini shake. Until then, I’ll just have to leave a lot of shake pathetically un-drunk. Ah well. I love that they offer a make-your-own burger option, with a huge variety in toppings, sauces, rubs, etc. Too bad for me that I get too excited about ALL THE TOPPINGS and want everything, and inevitably end up with some disgusting combination of like guacamole, pancetta and a fried egg with kona coffee rub. Yeesh. Mr. Beez goes for the pick-your-own menu, and since I am unskilled at such selections, I stick to the menu. I went for the Meat Your Maker burger, which featured dry aged wagyu beef with a sweet onion crust, gruyere, roasted tomatoes, field greens and truffled shallot aioli. It was heavenly. I could go for another one right now. Because Mr. Beez and I fail at parenting (or from Baby Beez’ perspective, we are awesome) we let Baby Beez have her own vanilla milkshake. This meant that she totally ignored her hot dog, carrots, and chips. But I guess it’s not all a loss. She got plenty of dairy that night from the shake. Healthy bones, healthy teeth, folks! A couple of weeks ago, I found myself with A FEW COMPLETELY UNSCHEDULED HOURS. I had a ton of work to do that weekend, but I got it all finished. I had a haircut appointment, but the haircut was all finished. Mr. Beez and Baby Beez were visiting with his parents. 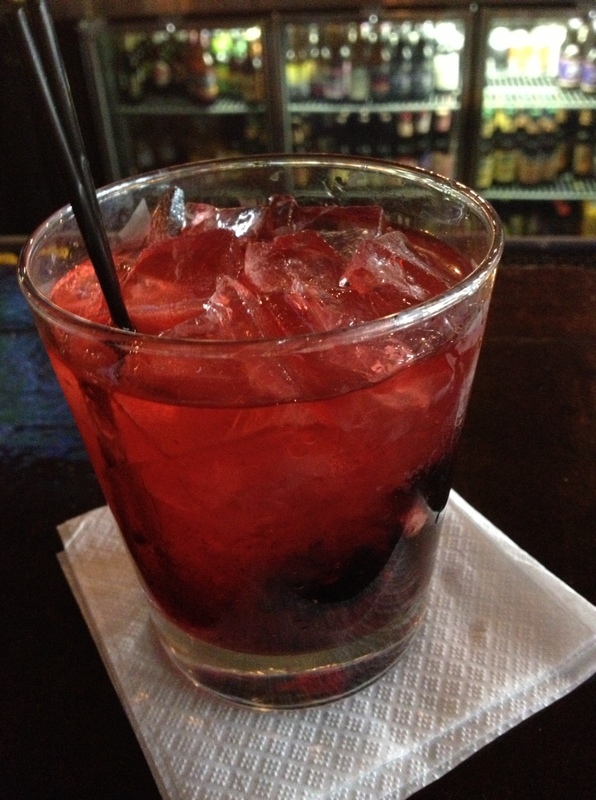 I had nothing to do, and I decided to do the most uncharacteristic thing for me ever…I went to a bar by myself! It was an awkward time in the afternoon, about 4pm on a Sunday, and although I had a list of places I’ve been meaning to try, a lot of them weren’t open. One, however, was– Industry Public House in Lawrenceville. I kicked things off with a Rhuby Rhuby Rhuby (blackberries muddled with simple syrup, Rhuby liquer, bitters, lemon zest and basil). You can’t go wrong with blackberries, ever. The cocktail was sweet but not sickeningly sweet. And it ha a nice punch from the liqueur. Industry has a huge number of beers and hard ciders on tap, and I was thrilled to also enjoy a draught of hard cider from Arsenal Cider House. For my meal, I enjoyed an amazing farmhouse burger with truffle fries. This fresh, tasty burger was topped with cheddar, BBQ sauce and a fried egg. This was my first truffle fry experience, and I don’t think any other kind of fry can make me happy again. My big plan for my free time was to chow down, have a couple drinks and read some magazines. Despite my usual antisocial attitude, I ended up chatting the whole time with other people. I didn’t get any magazine reading done, but had an equally nice time. Even though Larryville was already the bastion of all things trendy and cool, Industry is a fantastic addition. The service was great and quick, the food and drinks were delicious and obviously prepared with care. I don’t get to Lawrenceville as often as I’d like, but Industry is worth a special trip. A few weeks ago I saw advertisements for the PittsBurgher burger & music festival at the Rivers Casino, and thought “oh, that sounds fun.” Then a deal came up on LivingSocial for half off tickets, and I said “I’M IN!” Competition for the best burger in the burgh? Well yes I’d love to participate! 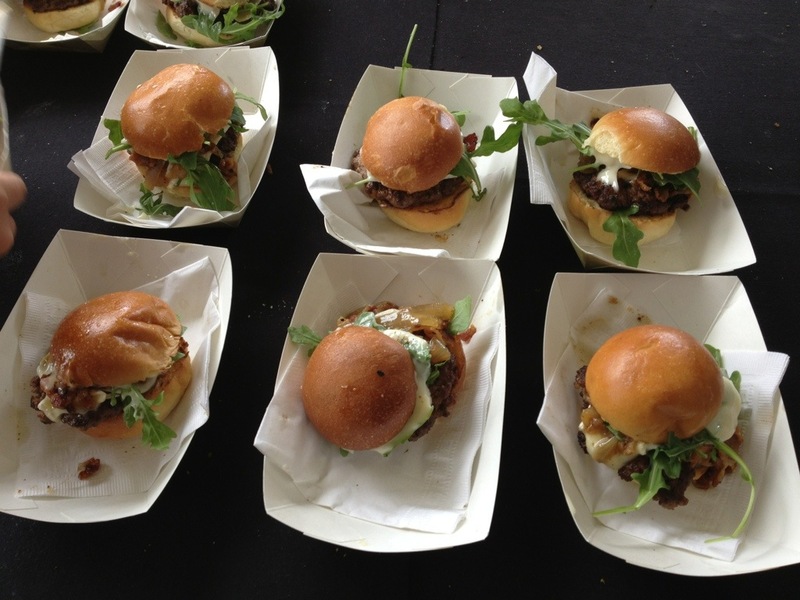 Conspicuously absent from the contestants were the big names in the Pittsburgh burger scene. 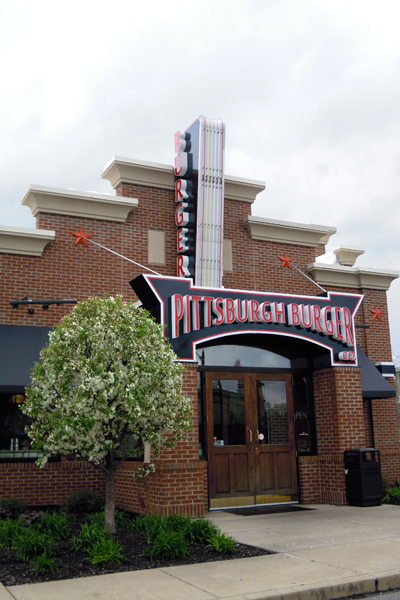 Tessaro’s, BRGR, Burgatory, FatHeads and most of the “usual” Pittsburgh burger places weren’t there. I don’t know if they were approached and declined, or weren’t approached at all. 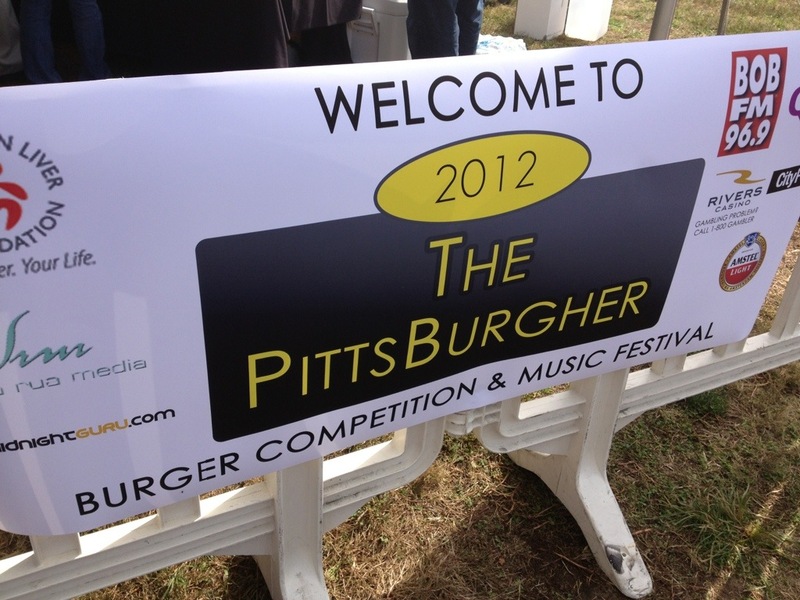 But without them, I’m not sure the event can really claim to seek out the “best” burger in Pittsburgh. The absence of these big names did give some lesser known restaurants a moment in the sun, so I liked the opportunity to check out the burgers from places like Bonnie & Clyde’s in Wexford and Melange Bistro, that I may have otherwise passed over if the known favorites were there. The Classic American Cheeseburger from the River’s Casino. 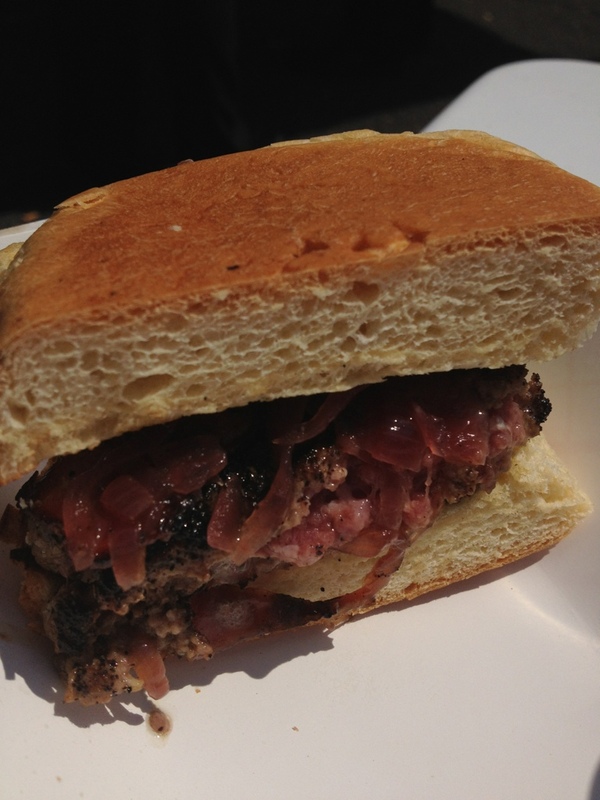 I’m not a fan of caraway, so I picked that off the bun, and the burger was delicious. I’m continually impressed by the high quality of the Rivers Casino food. I expect it to look fancy but taste bad, and each time I’ve had it (at this event, at the Pittsburgh Best Restaurant Party, and the Afterparty for the Best Restaurant Party), it has actually been very good. I feel like going to dinner at a steakhouse in a casino is very gaudy, but I’m tempted to try it, as I suspect it will far surpass my expectations. The Casino also offered a dessert cheeseburger, with deep fried chocolate something or other, but I’m sorry, that did not look appealing to me. 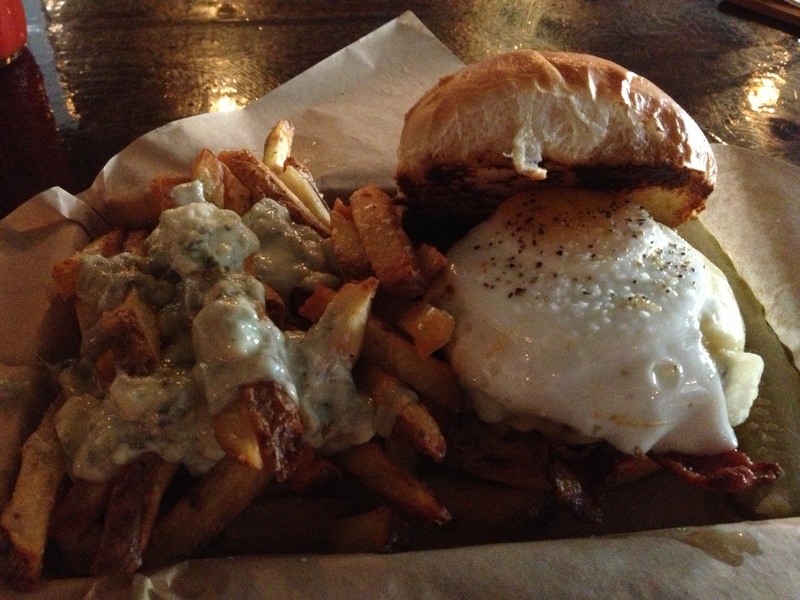 I sampled with an open mind, but my favorite truly was the Shipwreck Burger from Wingharts Burger & Whiskey Bar. Oh man I love that burger. If you aren’t familiar with this buttery, decadent delicacy, you are missing out sorely. It’s wonderfully greasy, due to being slathered in brie, onions, and arugula. It’s so rich that it should be eaten alone (don’t get fries with it, that is simply TOO much). I felt kind of lame picking a burger I was already familiar with as my favorite, but it really really was. WANT TO EAT ALL THE SHIPWRECK BURGERS. The other burgers were nothing to sneeze at. They all respectably held their own. 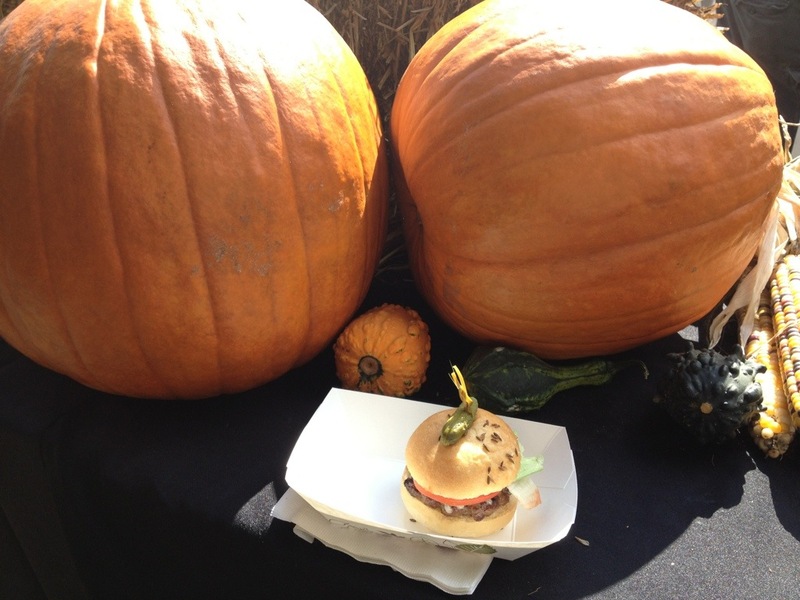 The burger samples were generous–some places handed out sliders, others gave full sized burgers sliced in half. It was a LOT of food. 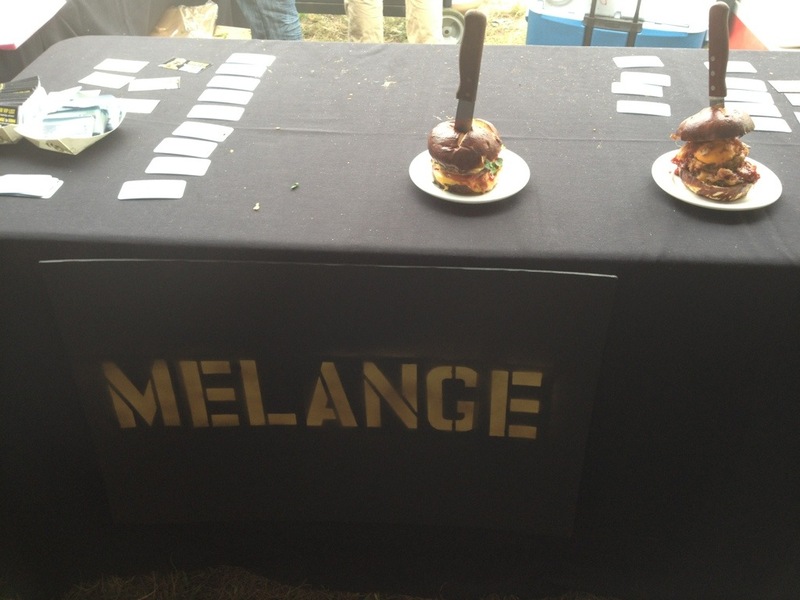 Melange served its burgers on delicious, soft pretzel buns. I was highly impressed by how good the bun was. 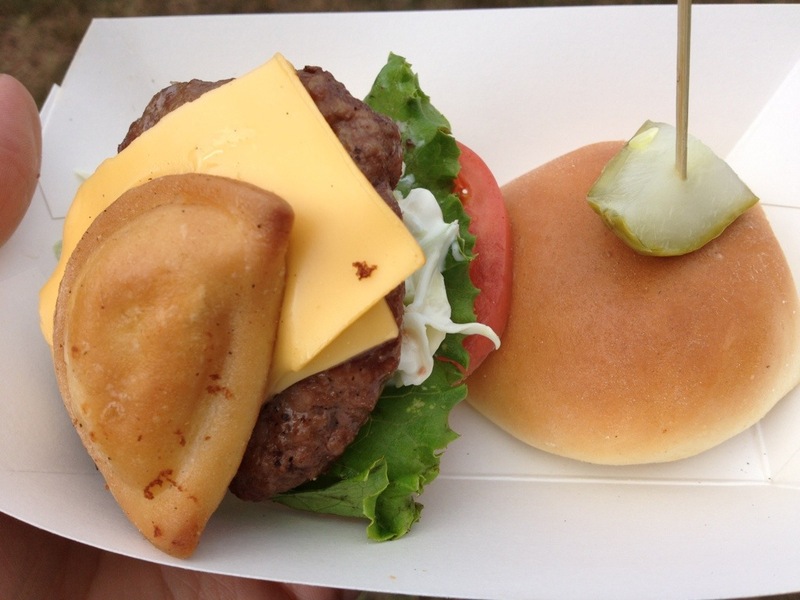 However, the patty got lost in there, and the taste of the patty itself was not memorable. If they kicked up the quality of the patty a bit, this would be a really great burger. The Bonnie & Clyde burger, topped with slaw (sadly mayo based, vinegar based would be better) and a pierogi. A pierogi is always a nice touch. These pierogies were fried and hard, so frying to a soft consistency would be a big improvement. However, all around, this was a pretty good burger. I failed to take a picture of Mr. Beez’ favorite- the cheeseburger from Cain’s Saloon in Mt. Lebanon. 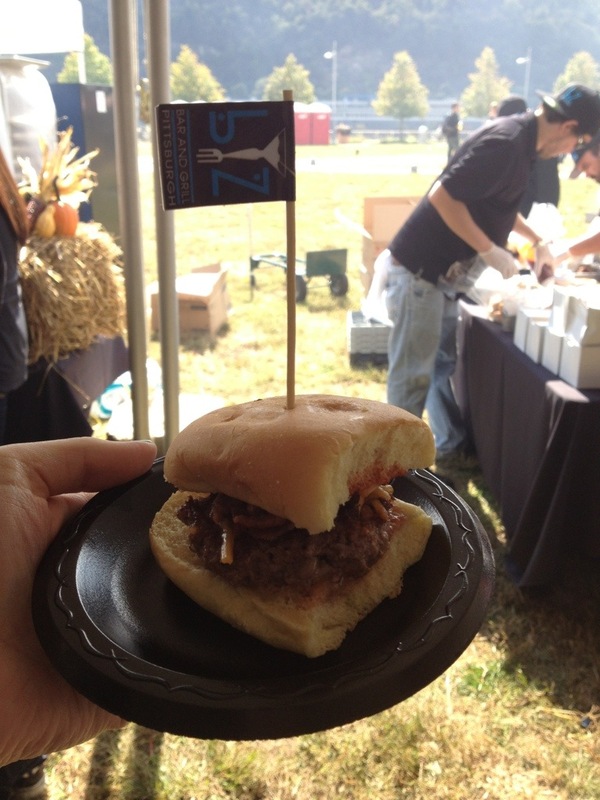 I agreed that the burger was tasty and flavorful. It wasn’t greasy, and it was not gristly. It was a straightforward burger, but accomplished its simplicity well. I was SO ridiculously stuffed after the event that I didn’t eat for the rest of the day (and there were a few booths I didn’t even make it to!) For a first time event, it went pretty well. As we were getting ready to leave, the tent was getting very very full, so next time around they may need to adjust the space or setup. We didn’t stay through the end, so I don’t know who won. If YOU know, please do share! You know you’re in Pittsburgh when…. 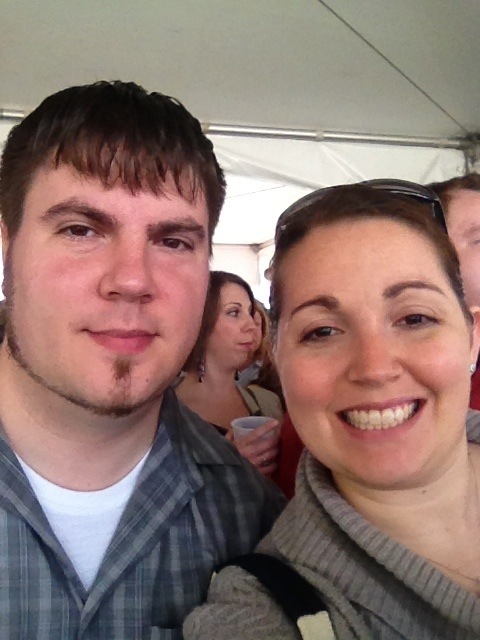 It’s FRIDAY in Pittsburgh, and that means it is time for FOOD TRUCKS! 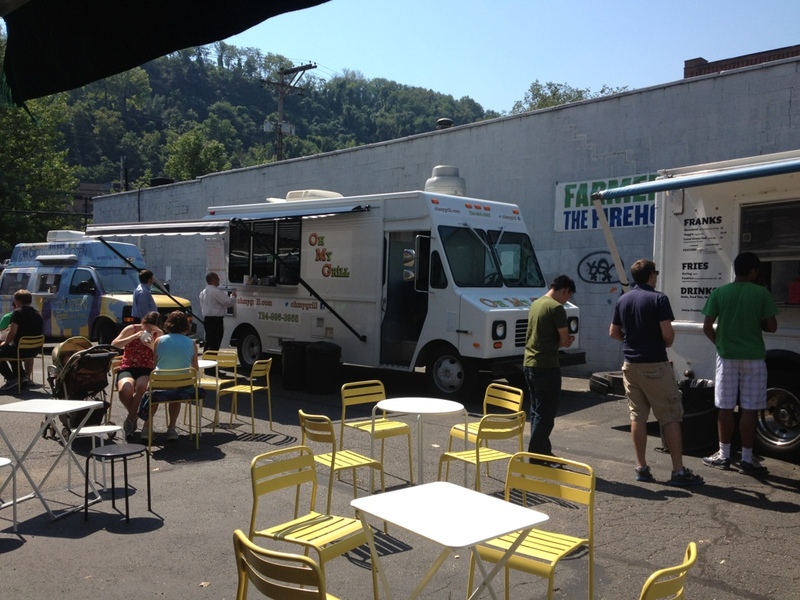 Bar Marco in the Strip generously hosts Food Truck Fridays in its parking lot, to demonstrate that food trucks and brick-and-mortar restaurants can live together in harmony. Mr. Beez, our friend David, and I ventured to the Strip to partake in the festivities last week. The weather was gorgeous, and the food delicious. In a horse-before-cart type maneuver, Fukuda sold grilled seafood delicacies, even though their restaurant has not yet opened. 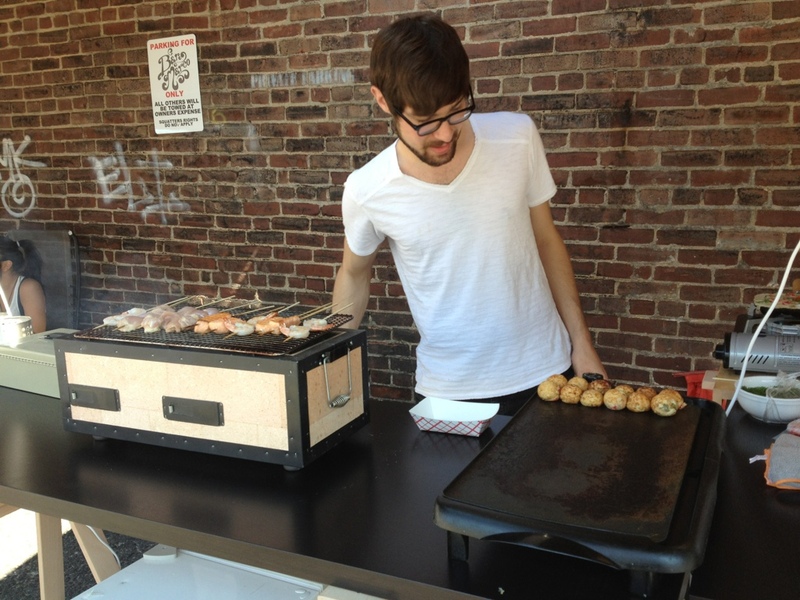 We tried an order of the octopus balls (on the grill on the right), which were kind of like crabcakes except with octopus. I liked that chewy pieces of octopus were distinct and flavorful. We were not shy. On our table you can see grilled cheese WITH CHEESE DIPPING SAUCE (whut?!) 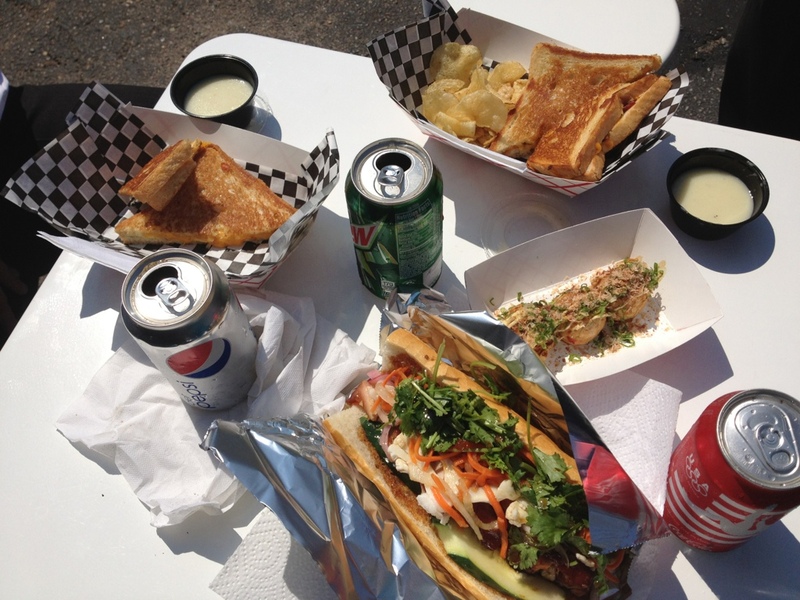 from Oh My Grill, the aforementioned octopus balls with fancy toppings from Fukuda, and an om nom nom so good banh mi from Lucy. Yes, I know I can buy a banh mi from Lucy pretty much whenever, but those sandwiches are so good that I CANNOT pass one up. Bonus– instead of trekking to the very crowded Strip for a banh mi on the weekend, parking is way easier on a Friday afternoon. This lovely morsel is the Bar Marco burger, in this picture sliced in half. It’s topped with grilled onions and is all kinds of amazing. I packed a lunch for work today, but looking at this picture I am very very tempted to haul myself down to the strip to get one of these for lunch instead. FRIENDS! I encourage you to support our local food trucks! I also encourage you to get a delicious cheap meal! So haul your backsides down to the Strip this afternoon, and get your lunch on! This week has been b-a-n-a-n-a-s. Work has been crazytimes, and I tried to relax a little today because I have to dive right back into work tomorrow, and the week ahead doesn’t look like it will be much calmer. The tricky thing about being a litigator is that you have to be sharp and creative and analytical all the time. In busy weeks, your brain can get very tired, and if your brain doesn’t get un-tired, you get bogged down and sometimes it feels like your brain is foggy. I’m trying to avoid that. ANYWAY, to the matter at hand. Tonight felt like a perfect night to go out for a family dinner. Mr. Beez and I had a taste for Burgatory, but they unfortunately had a wait of more than two hours when we called at 5:30 pm. I read a POPCity article on the Pittsburgh Burger Company some time back, and Mr. Beez and I had filed it away as “some place to try in the future.” This was a great night for it. We both like to try new things, and Mr. Beez was keen to try wild game burgers. The restaurant was not busy at all when we got there around 5:45 (having a toddler in tow means we eat early, or everyone is miserable). Even when we left closer to 7, it was still pretty quiet. The restaurant is in spitting distance of a Red Robin, and its prices and decor suggest it’s targeting the same clientele, I’m not sure this is the best location for a place like this to stand out. 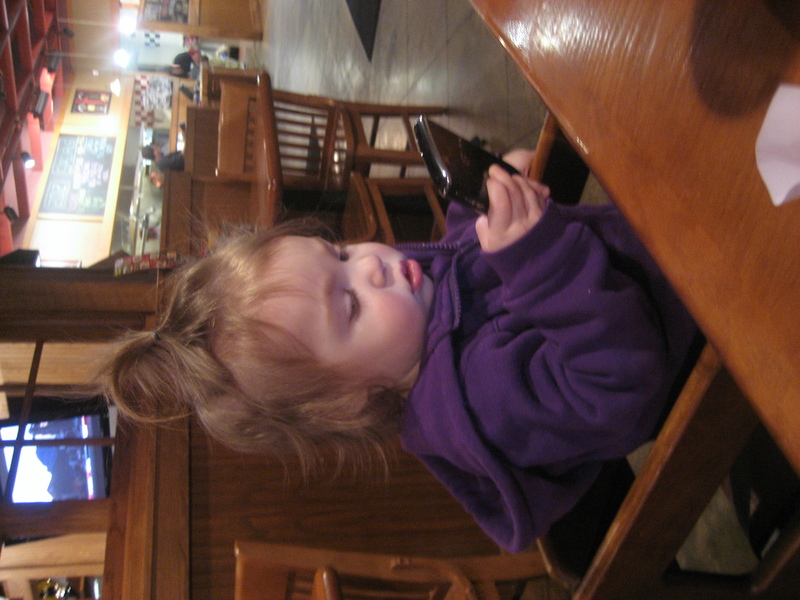 The server was very quick and attentive. Mr. Beez was excited to order a buffalo burger, but unfortunately they were out of both the buffalo and the kobe beef. He ended up ordering the venison and said it was kind of dry (but I think venison is supposed to be dry). He got his burger with french fries, and said they were so-so. Baby Beez is in a phase right now where she desperately WANTS to use silverware on her own, and doesn’t want any help with feeding herself, but she is terrible and messy with it. We got her grilled cheese and mashed potatoes, and although she wasn’t interested in the grilled cheese, she was plenty entertained with sloppily feeding herself mashed potatoes. I got the lamb burger with grilled onions, sauteed mushrooms, and monterey jack cheese. The burger was greasy (in a good way) and delicious. I really enjoyed my burger, and was glad that I could request the salad bar instead of fries, but the salad bar, although fresh, wasn’t particularly interesting. The desserts also looked tasty enough, but none of them stood out as particularly interesting or exciting. Pittsburgh has a glut of inventive and delicious hamburger restaurants. With the newer choices like Burgatory or Wingharts, or the Pittsburgh legends FatHeads or Tessaro’s, Pittsburgh Burger Company fails to stand out. It’s got a niche it can build on– although I believe other places may have some kind of wild game offering, it’s not the major focus. Pittsburgh Burger Company does a great job with the wild game burgers themselves, but otherwise fails to distinguish itself from a Red Robin or the Fuddrucker’s that formerly inhabited its building.